Black Friday Results – Who knew? 1. Black Friday Sales were down. 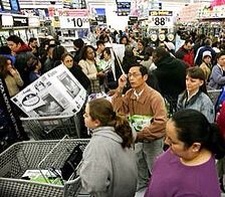 Black Friday – Friday retail sales were down 1.8% over the previous year according to the research firm ShopperTrak. 2. Thursday and Black Friday Weekend sales were up. It's also doubtless that overall sales for the holiday opening are up over last year due to an improving economy. The average spend over the Thanksgiving weekend was $423 this year from $398 last year according to the retail federation. 3. Did Thursday openings add to the total Holiday sales? Hard to Say. It's uncertain if stretching Black Friday to include the added Thursday openings really made a difference in what would have otherwise been spent. For the major retailers, “You want to be open if they want to go shopping,” said Laura Gurski, partner at A.T. Kearney's retail practice. But that's a bit of a “monkey see – monkey do” kind of thing. Confusing things even more, “Now we're seeing really, a five-day weekend that starts on Thursday,” said Mathhew Shay of the National Retail Federation, adding Cyber Monday to the mix. Certainly, those who showed up Thursday evening to buy a door buster Plasma screen TV, don't buy a second one on Friday. “Consumers have only so many gifts to buy and only so much to spend” said MIchael Niemera, chief economist for the International Council of Shopping Centers. So there you have it, if you want to believe that Black Friday sales were down due to the Thursday opening, you are right. If you feel that sales were up overall during the Black Friday period from Thursday through the weekend, then you are also right. If you're just uncertain that opening on Thursday really adds much to overall sales, then you can share that uncertainty with many experts. For me, I'm still trying to figure out what to buy her for Christmas and the stores are always open Christmas eve. This entry was posted in Business and tagged Black Friday, Cyber Monday, retail, retailing, shopping. Bookmark the permalink. 3 Responses to Black Friday Results – Who knew? Art, Is there any evidence whether or not online sales have affected Black Friday sales? Were online sales up, down, or static? It may be a planning thing, but I shop online for Christmas gifts, as well as other things, all year long. Therefore by Christmas, everything is paid for and I never enter a new year with a big honking bill. Therefore at least for me, Black Friday is more of a big whup than anything and I’m certainly not going to stand in a crowd at some weird hour to spend some bucks on, very probably, something I really don’t need. Jeff, online sales are up substantially, and certainly they affected Black Friday sales. Nevertheless, brick and mortar sales are also up overall – but spread over a Black Friday weekend including Thursday evening. What IS uncertain is whether the early openings on Thursday helped increase overall sales for retailers or just spread the sales over a larger period. Art, I guess it depends on the metrics collected as to whether or not the sales have increased or just spread out. It’s hard to have any comparison when Black Friday attributes seem to change every year. Total number of “shoppers” is not very accurate since some percentage of those entering a store won’t spend any bucks. Total revenues each year would need to take price changes, either up or down (yeah right!) into account. Percentage profit might work but again there are variables such as initial product cost, markup, volumes sold, or percentage discount that would need to be taken into account. I don’t know how many companies, especially small businesses, that have the time or where-with-all to track such metrics in order to establish a true benchmark against which subsequent years are compared.